It should have been a normal day, but when you open your mailbox, you received an official letter from the IRS. They want to audit you thoroughly. The algorithm that the Internal Revenue Service uses to choose the next review has been shown to choose small business owners over individuals because the unreported income from these firms causes a $125 billion tax gap. Did you keep all of your receipts? Because just being a small business is a red flag for the agency. Other red flags include making over $200,000 – $1 million in a fiscal year, reporting large charitable donations, landowners with rental losses, and failing to report foreign bank accounts. When the IRS audits you, they will review and examine all of your records, including income, expenses, and profit to make sure it lines up with your tax returns. Even so, only 0.8% of tax returns were audited in 2015. There are often misconceptions about being audited that can make it difficult for you to prepare. Let us debunk a few. The tax agency is looking anything out of the ordinary so if you pride yourself on your honesty then do not fear the tax audit. Don’t get lost the anxiety that these myths create. The IRS makes it so easy for you to file an extension. All you have to do is click the link on their website. If you are living abroad, military personnel in a combat zone, or a person afflicted with a natural disaster, you automatically get an extension. If you filed an extension, then chances are you were careful and thorough, so the secret algorithm doesn’t flag this. The agency has undergone about $1 billion in budget cuts, which means there are less personnel and fewer inspections. While this may make tax evaders happy, it costs the government about billions in revenue. That translates to seeing higher taxes and budget cuts like the one school programs are currently facing. The deduction must make sense. It’s the $30,000 for three months of business meals, flights, and hotel accommodations for a sole proprietorship that raises eyebrows. Home office deductions are legitimate, and if financial hardship comes your way, all you need is an explanation of your circumstances. Correcting your mistakes on an e-filed tax return is a good thing. The IRS just treats it like a new tax return and scans for anything out of the ordinary. Give thorough explanations that make sense, and the stress ends there. The IRS can only take what is legally owed. If you cooperate with them, then they will work with you. They are not the government’s gangsters who will burn the house and take all of the insurance money, your grandma’s heirlooms, and your grandpa’s pension for all the trouble you caused. In 1998, the Taxpayer’s Bill of Rights (IRS Restructure and Reform Act) was passed to ensure that if you owe, they will treat you fairly. Take a deep breath and calm the anxiety because this process is not a horrible one. The agency is looking for anything out of the ordinary that doesn’t make sense. The official word is the selection process is random and uses statistical norms to scan for comparison of an individual’s tax return. The IRS can go back as far as three years for a standard audit. If there are irreconcilable errors, then they will add on more years to their investigation. They take as long as they need too to complete their audit. There have been reports of an audit lasting about seven months, but the IRS does not give an official timeframe. The IRS uses snail mail for initial contact. Emails or phone calls claiming to be the IRS are more than likely a scam. Keep your address up to date because not receiving the notices from the agency does not exempt you from being audited. Ignore these notices and you will see wage garnishments or property seizure. Correspondence audits – usually done strictly through the mail and are the most common one that small business will see. You can request an in-person examination if you so choose to. Field audit – usually happens at a person’s place of business. They are there to do a thorough inspection of everything you have claimed. Office audit – when you are asked to bring your records to the closest office. 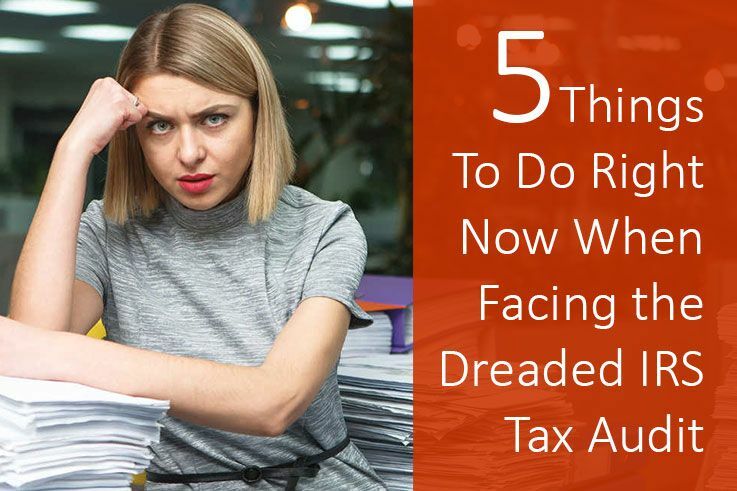 To help ease some stress, we would like to share some steps you can take immediately when facing an IRS tax audit. Learn what an IRS tax audit means. Basically, an audit means that the IRS is going to review your files and compare them with your tax records. They do this to make sure the information on your tax forms has been accurately documented. It is your right to ask exactly why you’re being audited. Sometimes people are randomly selected; other times there are red flags on their returns. Verify that the request came from the IRS. There are many tax scams out there trying to bully people into sending money. Unless you’ve received a verified letter from a documented IRS address, it’s very possible that you’re dealing with a scheme, especially if you a phone call or email was the first method of contact. Find out how you or your business will be audited. There are multiple ways to audit someone. You may be asked to compile information and mail it to an IRS office, or you may be asked to deliver the information personally during a meeting with an auditor. In other cases, a field auditor will come to your home or business. Read what is being requested and understand what is expected of you before going through the audit process itself. Meet with your bookkeeper, accountant and/or tax preparer. If you’re confused by why you’re being audited or you generally have someone else take care of your finances and taxes, it’s important to meet with a company that offers small business tax services. They will be able to give you more insight into why this is happening and what you can do about it to thoroughly prepare. They may also need to provide documentation of their own. Make sure your documents are in order. Once you’ve found out why you’re being audited and how the audit is going to be carried out, the next step is to get the appropriate documents together. If you’re asked to send in some documentation, make sure to send copies and keep the originals. Try to provide as detailed a paper trail as possible in the effort of making the process go as smoothly as possible. Are you facing an IRS tax audit? Consider getting LLB CPA and Associates on your side. This can be a scary situation to find yourself in. We understand this and have years of experience providing IRS tax audit help. Contact us today to find out more about what we do.